Uncover a fresh, luminous look with this deeply hydrating Diamond Face Peel. Blended with caviar, papaya and microalgae, as well as nourishing vitamins and minerals, this exfoliating peel gently buffs away dead skin cells to fight dullness and renew. It also targets the look of enlarged pores and discolouration for a balanced, happy complexion. Mild on skin. Massage into face and neck using circular movements and peel away dead skin cells. Rinse well. Regenerating, revitalizing, and nourishing. This revolutionary formulation of intelligent skin care harnesses the incredible benefits of natural Caviar. It is blended with an infusion of concentrated Torricelumn™ - Elizabeth Grant Skin Care’s anti-aging compound with intensive moisturizing and skin plumping properties. 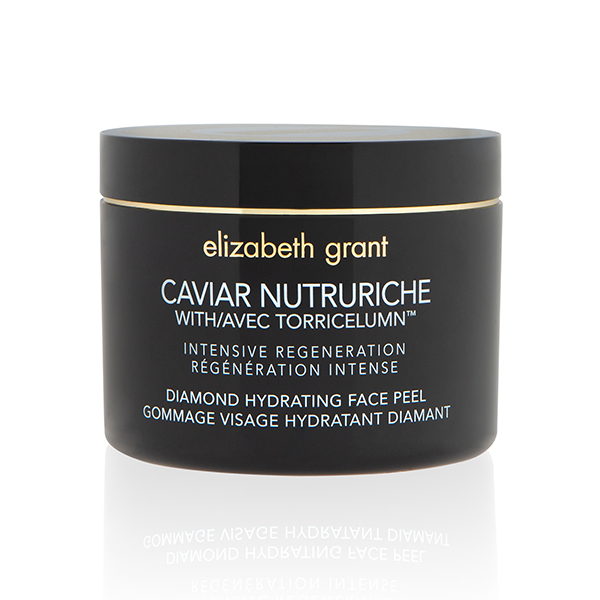 The Caviar Nutruriche line with rich proteins, the highest quality natural extracts and essential omega-3 fatty acids, works to regenerate skin, improving radiance and evening skin tone. This collection is best for skin suffering from dehydration, heavy lines, wrinkles and signs of ageing.